The Columbia Generating Station (CGS) sits on the Hanford Nuclear Reservation in the Columbia River northeast of Portland, generating less than 4% of the region's energy. Alliance for Democracy member Nancy Matela talks about the need to shut it down, describing the dangers posed by its unneeded continued operation. The CGS design is a version of the Fukushima Nuclear Plant. Nancy talks about other plants across the nation with the same design as well as how to replace the energy upon closing. RICHLAND, Wash. (AP) - Two Seattle-based groups are calling for the closure of the Northwest's only commercial nuclear power plant. Heart of America Northwest and Washington Physicians for Social Responsibility on Wednesday said the Columbia Generating Station should be closed because of worries about the storage pool that cools used nuclear fuel. A new report commissioned by the groups also questioned worker protection at the plant, which is on leased land at the Hanford Nuclear Reservation. The Tri-City Herald reported the plant employs about 850 people and generates about 4 percent of the electricity in the Northwest through the Bonneville Power Administration. The report was written by Robert Alvarez, a frequent critic of nuclear power and a senior scholar at the Institute for Policy Studies. The report is "64 pages of details about a plant that the author knows very little about," said Mike Paoli, spokesman for Energy Northwest, which operates the plant. The report concluded that safely storing used nuclear fuel at the plant site is a major public safety priority. Used fuel is stored within the reactor until it is cooled enough to remove to storage outside the building. "The most dangerous wastes are located in the elevated spent fuel pool, perched five stories above the ground next to the reactor," Alvarez said in a statement. If the pool were to lose water during a catastrophic event, such as an earthquake, the fuel could catch fire and the fallout could spread radioactive material over a wide area, according to the report. Energy Northwest countered that such a fire in a steel-lined concrete structure is so unlikely that it's not included in the potential disasters the company plans for at the reactor. The report also criticized worker safety, saying that from 1999 to 2011, the Energy Northwest plant was responsible for nearly half the radiation exposure of all workers on the Department of Energy's Hanford Nuclear Reservation. Paoli said the Energy Northwest nuclear plant has not exceeded federal limits for worker exposure annually for at least 17 years, the period when records were immediately accessible. Columbia Generating Station - Close It Down! 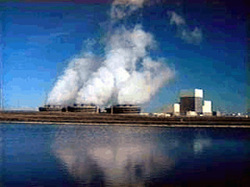 The Columbia Generating Station (CGS), previously known as WPPSS #2, is the Pacific Northwest’s only remaining nuclear power plant. Its GE Mark II design is very similar to the three reactors that melted down in Fukushima, Japan in March 2011. The CGS nuclear plant has the same flaws in its design that allowed radiation to escape containment in Fukushima. These flaws include a containment vessel that is too small. a waste storage fuel pool that is built five stories above ground, and a faulty design allowing hydrogen to build up inside posing a threat of explosion. It also produces 50,000 pounds of highly radioactive waste each year with no off site treatment or storage solution in sight. Something as simple as flooded pumps, or a loss of power for cooling, can lead to a meltdown. Other events that could result in a serious accident include terrorist acts, earthquakes, a dam failure, or operator error. The reactor, a boiling water design, has been used for 27 years and is nearing the end of its design life. A full-scale accident at the fuel pool alone could release ten times as much radiation as was released in the Chernobyl accident. CGS sits on the Columbia River which it uses as its coolant and on the Hanford Nuclear Reservation just miles from the leaking containers of World War II waste. An accident at CGS would most certainly involve further release of the low and high level radioactive waste including strontium-90, cesium and plutonium into the ground water and ultimately to the Columbia River as well as into the air. Some people defend nuclear power as being relatively cheap and clean. The cost of nuclear power is much higher than alternatives when all costs including radioactive waste storage are added. According to a 2009 Bonneville Power Administration analysis, it costs more to maintain and operate the Columbia Generating Station than all 31 of the hydropower plants in the Columbia Basin combined. The cost of nuclear is going up, while the prices for wind, solar, and other alternatives are going down. With less than 4% of the region’s energy coming from the nuclear plant, the plant can be replaced with energy efficiency and renewable energy. Nuclear power is far from clean. The pollution of the ground, water and air come primarily from mining the uranium, building the power plant and decommissioning the plant at end of life. There is a high number of cancer deaths among First Nation people who live near the uranium mines. Carbon production is also exceptionally high during these phases of a nuclear power plant. The 27 member public utility districts (PUDs) of Energy Northwest (formerly WPPSS) are the owners of this risky reactor on the Columbia River. 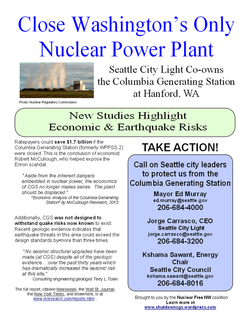 A coalition of organizations including Alliance for Democracy, Sierra Club, No Nukes NW, and Physicians for Social Responsibility call on them to close the Columbia Generating Station nuclear power plant.